Julie Krone will be on hand for the a free autography session from 5 to 6 p.m. for the inaugural Remember Me Rescue fundraiser Friday night at Lone Star Park. GRAND PRAIRIE, TX—APRIL 24, 2013—Legendary Hall of Fame Jockey, Julie Krone and Hall of Fame Trainer, Jack Van Berg will be appearing at Lone Star Park this Friday, April 26 at 6:30 p.m. for the Inaugural Remember Me Rescue Celebrity Dinner and Fundraiser to support the aftercare of Thoroughbred race horses. The pair will also appear at a free autograph session from 5:00 p.m. to 6:00 p.m. 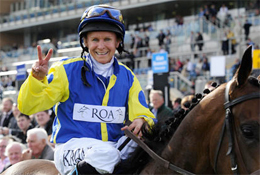 All-time winningest female jockey, Julie Krone retired from racing for the first time at Lone Star Park on April 18, 1999 after winning three races here that day. 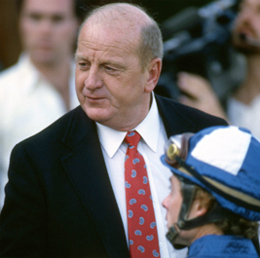 With $81 million in career winnings, Krone was inducted into the Thoroughbred Racing Hall of Fame in 2000. She was the first female jockey to win a Triple Crown race, the 1993 Belmont Stakes aboard Colonial Affair. Julie Krone will host the event with keynote speaker, Maggi Moss. Inducted into the National Museum of Racing and Hall of Fame in 1985, Jack Van Berg was leading trainer by wins nine times and won the Eclipse Award in 1984. Among his best horses were Alysheba, who won the Kentucky Derby and Preakness Stakes in 1987 and the Breeders’ Cup Classic the following year, and Gate Dancer, who won the Preakness Stakes in 1984. Jack Van Berg will be Auctioneer for live auction items. Autograph Session with Julie Krone and Jack Van Berg will be held beforehand from 5:00 p.m. to 6:00 p.m. the inside East Grandstand entrance lobby. Van Berg will also sign copies of the book “Jack, from Grit to Glory” by Chris Kotulak, which will be available for purchase. For more information on Remember Me Rescue or to purchase tickets to this event CLICK HERE.